5 points about Danny Cater. Danny Cater’s baseball career will be remembered most for two things- the first is on March 22, 1972 the New York Yankees traded Cater to the Boston Red Sox for relief pitcher Sparky Lyle. Cater would be a part-time player for the Red Sox for a couple years, Lyle would be the Yankees ace relief pitcher for most of the 70’s- winning the Cy Young Award in 1977 and making three All-Star Teams. One of the worst trades in baseball history. The second thing Cater will be remembered for- 1968 was the Year of the Pitcher in baseball. In the American League Carl Yastrzemski would win the batting title with the lowest average ever for a batting champion .301. Danny Cater was the runner up that year with a .290 average- he was with the Oakland A’s at that time. Cater was a first baseman, left fielder and third baseman during his playing career. He played first base the most with 731 games, 291 in left and 225 at third base. He came up at age 24 with the Phillies in 1964, White Sox 1965-66, A’s 1966-69, Yankees 1970-71- Red Sox 1972-74 before going back to the National League and finishing his major league career with the St. Louis Cardinals in 1975. Cater was 6’0″ 170 he hit and threw right handed. His career stats- 66 home runs, 519 RBI- a .276 batting average. His on base percentage was .316. He didn’t strike out much but didn’t walk much either. Didn’t have much speed on the bases 26 steals while he was caught attempting to steal 30 times. 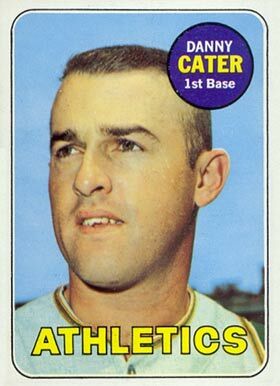 Cater was a regular in the major leagues from 1965-72- getting over 500 at bats in each of those seasons. He is now seventy-eight years old and lives in his native Texas.